For brewers who want to start treating their water appropriately, but don’t want to wade through the requisite chemistry, here’s the final installment in my series of simple water guides. Today’s post is a straightforward guide to generating brewing liquor for pale beers from 0 to 10 SRM. In practice, of course, it would hard to brew an all-malt beer below 3 SRM. But, I’ll cover the whole range. 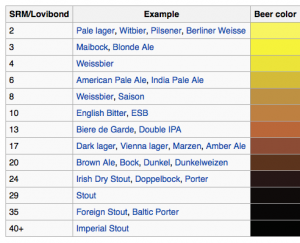 This includes some pale ales, most wheat ales, Kölsch, Pilsners and other light lagers. You begin with 5.0 gallons (19 L) of distilled water and add minerals to create your brewing liquor. Learning more about water chemistry will help you in the long run. However, as with a lot of things, a simple introduction to the basics will get you 90% of the way to where a water maven is in terms of results. Still, there’s more than one solution to making brewing water from scratch. (For example, this guide differs from my guide for making “IPA water.” Both will work, but they aren’t identical.) With this in mind, I’m going to release a slightly expanded version of these guides soon that give brewers some added options. This will be slightly less simple, but a bit more flexible. Here is a guide to making 5.0 gallons (19 L) of brewing liquor for a pale beers, starting with 5.0 gallons (19 L) of distilled water. If you are a 5.0 gallon (19-L) extract brewer, you only need to make half this volume. Halve the volumes of water and the amounts of minerals added. Use the treated water (the brewing liquor) for steeping your grains or doing a partial mash and for the water in the boil. Use distilled water for topping up to your full batch size. All-grain brewers will need to estimate how much water they will need and mix up sufficient brewing liquor. Your first step is always to ensure that your brewing liquor has sufficient calcium. Calcium has a number of benefits in the mash and in the boil. I like to start with at least 100 ppm (roughly 100 mg/L) of calcium in my brewing liquor. 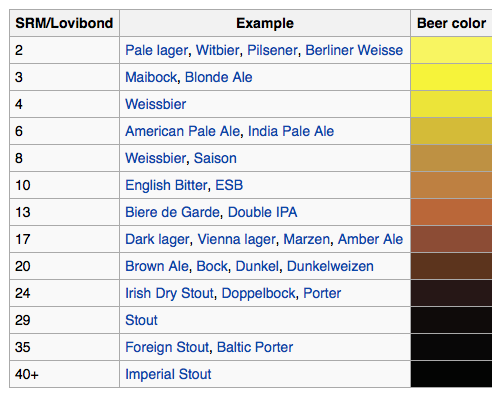 So, no matter what your estimated beer color is, start by adding calcium to your 5.0 gallons (19 L) of distilled water. If you are brewing a beer with a nice malt and hop balance, add 1 tsp. (roughly 4 g) of gypsum (CaSO4) and 1 tsp. (roughly 3.4 g) of calcium chloride (CaCl2). If you are brewing a hoppy beer, such as an IPA, add 2 tsp. (roughly 8 g) of gypsum and no calcium chloride. In both cases, this will give you roughly 100 ppm calcium. In the case of the hoppy beer brewing liquor, you will also have 200 ppm sulfate in the water, which should accentuate the beer’s hop bitterness nicely. The second, and final, step is to add an amount of carbonates to the water that is appropriate to get the mash pH to settle in between 5.2 and 5.6. (You could simply add less calcium and skip the addition of sodium bicarbonate, but calcium has a variety of benefits and for the sake of simplicity, I’ve gone with this option.) For a beer near 0 SRM, add 0.25 tsp. (this is only about 1.1 g) of baking soda (sodium bicarbonate, NaHCO3). For a beer near 10 SRM, add 0.75 tsp. (roughly 3.3 g) of baking soda (NaHCO3). For beers between 0 and 10 SRM — and let’s face it, you’re probably not brewing anything below 3 SRM — add an intermediate amount. For example, 0.5 tsp. (2.2 g) of baking soda (NaHCO3) in 5.0 gallons (19 L) of distilled water is the right amount for beers that are estimated to be around 5 SRM (assuming you’ve got 100 ppm calcium). You should taste the distilled water before treating it, and after the minerals are dissolved. At first, it shouldn’t taste like anything. With the minerals added, it should taste pleasant (as you would expect mineral water to taste). If you are an all-grain brewer, you should take the pH of your mash — and it should fall within the 5.2–5.6 range, with the lower half of this range being preferable. Keep in mind that the mash pH might change early in the mash and you may have to wait for it to settle into a stable reading. During the boil, you should look for the presence of hot break. It should look like like big, fluffy “snowflakes” floating in otherwise clear wort. If your wort looks muddy or each piece of break material is just a small speck, add another 50 ppm of calcium to the boil. For 5.0 gallons (19 L) of wort, this is 1 tsp. of either gypsum or calcium chloride, or a blend of the two. If you’re using brewing liquor made from distilled water, adding a dose of complete yeast nutrients to the boil may be a good idea to ensure that any trace elements the yeast may need are present. And finally, you should taste your beer critically. If you have brewed pale beers before, treating your brewing liquor should improve their flavor. If it didn’t, your local water is likely suitable for brewing beers in this color range and there is no reason to go to the extra hassle. Hey, Chris. Great series. You left a reference to “brown” beers in the final paragraph. Like the part about not adding CaCl to hoppy IPAs.